Have you ever watched an episode of Chopped, and had a super weird food craving? Well, that happened to me, not too long ago. 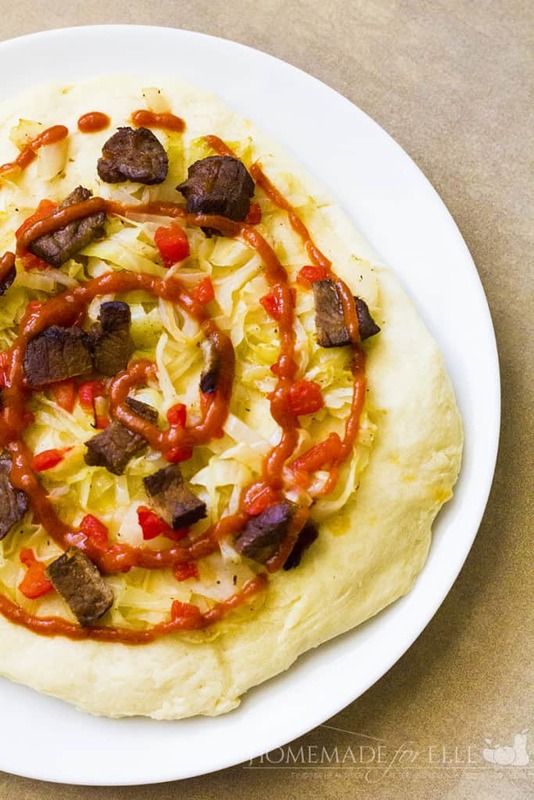 I somehow concocted the idea of a sauerkraut and sriracha pizza, and decided to give it a try. In my head, this pizza was a cross between a Reuben sandwich (a personal favorite of mine) and an Asian stir-fry, piled on a homemade pizza. And yeah, I know, that sounds super weird… but it turned out remarkably tasty. A little savory, a little salty, a little spicy, and the pizza crust is amazing. In a small bowl combine yeast, sugar and warm water. Stir well, and let sit for 15 minutes until the mixture is foamy. In a large bowl, combine flour and salt. Pour in yeast mixture and olive oil, and mix together with a fork. Once mostly combined, turn the dough onto a floured surface. Knead the pizza dough until smooth. Lightly coat your large bowl with olive oil, then place pizza dough in the bowl, cover with a clean towel, and let rise for 1 – 1.5 hours, or until dough has doubled in size. Add all ingredients to a medium saucepan. Stir well. Bring water to a boil, cover and reduce heat to medium-low, stirring occasionally until cabbage is tender, about 15 minutes. Place steak in a shallow glass dish. Combine rest of ingredients in a small bowl, and whisk well. Pour marinade over steak, and marinate at least 1 hour, and up to 12 hours. Cook in a cast iron skillet, grill or heavy pan until almost cooked through. Here is how to pull it all together! Lightly oil a pizza stone or baking sheet with olive oil. Turn pizza dough out onto a floured surface and use a rolling pin or sturdy glass to shape the dough into a circle of desired thickness. 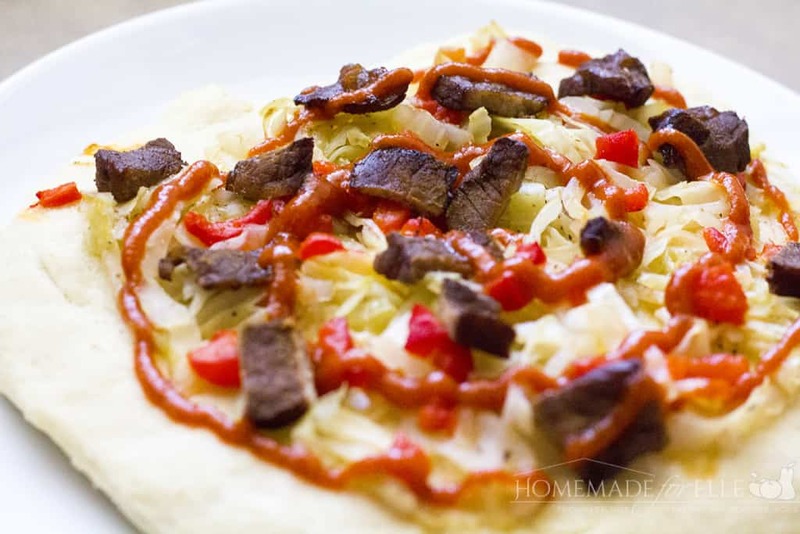 Top with sauerkraut, sirloin streak and red peppers. Bake in preheated oven for 8 - 12 minutes, or until crust is cooked and crisp. 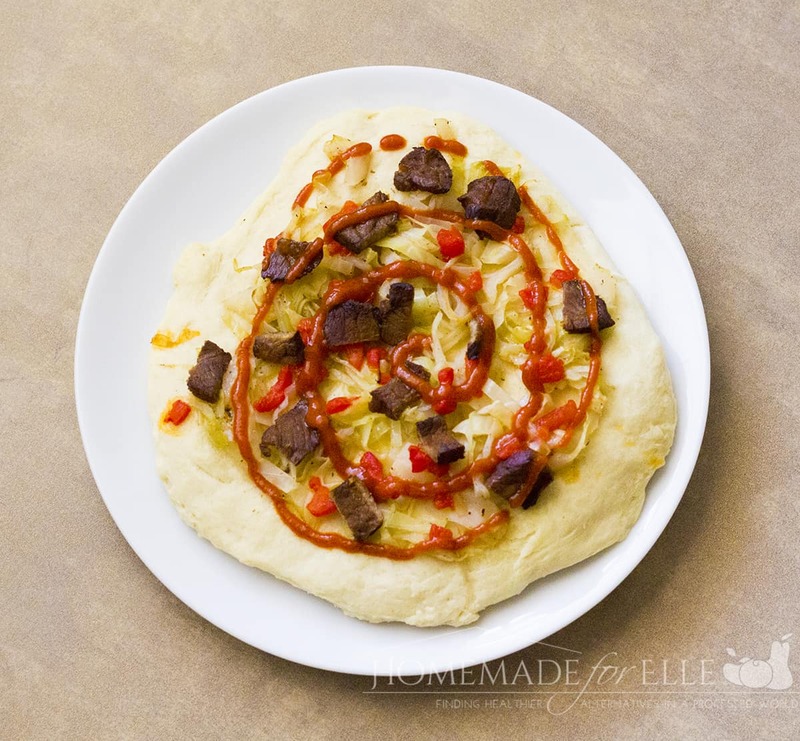 Allow to cool a couple minutes, then drizzle on sriracha in a circular pattern, starting from the center and rotating outward. Now that is a strange but tasty pizza! What is your favorite “odd” pizza? Share in the comments below!